Father’s Day is celebrated in the U.S. and 69 other countries on the third Sunday in June (some other countries celebrate it in September). Last year in Australia there was quite a furor over the notion of changing the name to “Special Person’s Day.” Some reasoned the change would ensure that children without dads would not feel excluded from the celebration. While it behooves us to include children who don’t have at-home dads, I don’t think a name change would help much—we’d also have to change the name of Mother’s Day and several other holidays to avoid exclusion or offense. My only complaint about Father’s Day is that, because it falls on Sunday, we fathers don’t get a day off work! Father’s Day and Mother’s Day celebrations give us opportunity to obey the commands given in the Bible to honor our parents. However, those commands present a problem for people who have had abusive parents. What are they supposed to do? While there are no easy answers, it’s important to remember three things: First, that God fully understands what those who were hurt by their parents endured—he sees and cares. Second, that giving honor does not mean condoning or continuing to endure abuse. Third, that the ability to honor those who have abused us does not come from within—it’s a gift from God that involves sharing in the mind of Jesus who willingly died for undeserving sinners (Romans 5:8). With Jesus, by the Spirit, we can give honor to those who don’t deserve it. We do so by looking beyond the pain they’ve caused, and instead of seeking revenge, seeing them as a child created by God. Don’t get me wrong, God does not love the pain they have caused, but he does love the child he created. Let me emphasize that we are not called to honor our parents on our own power. Instead, enabled by the Holy Spirit, we see them in the light of Christ—the light of what our Lord intends for them. In that light, we are able to honor our parents because we know that Jesus, as Mediator, stands between us and them—he is Lord and Savior of that relationship. We also know and trust that Jesus’ purposes for us cannot be thwarted by bad parenting. Through him and by him we have a heavenly Father who graciously rules over all earthly fathers (and mothers). Here is a video of the joy-filled worship in the GCI congregation in Limpopo, South Africa. GCI’s congregation in Bowling Green, KY (pictured below), celebrated its 50th anniversary on Pentecost Sunday. The celebration was led by Facilitator Bonnie Ferranti and the sermon was given by guest speaker Lloyd Briggie. The celebration capped off with lunch at a local restaurant. 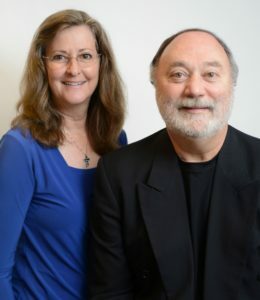 GCI’s congregation in Hickory, NC, recently re-launched, moving to a new location with a new ministry focus. The video below tells the story. To download it on Vimeo, click here. Greg Williams looks at the seasons of change and movement in our lives and compares them to the faith-filled journey of Abraham and Sarah. Here are topics from our GCI family to pray about each day in June. Santiago Lange looks at the controversial but important topic of worship. Georgia McKinnon looks at the busy summer season in children’s ministry. 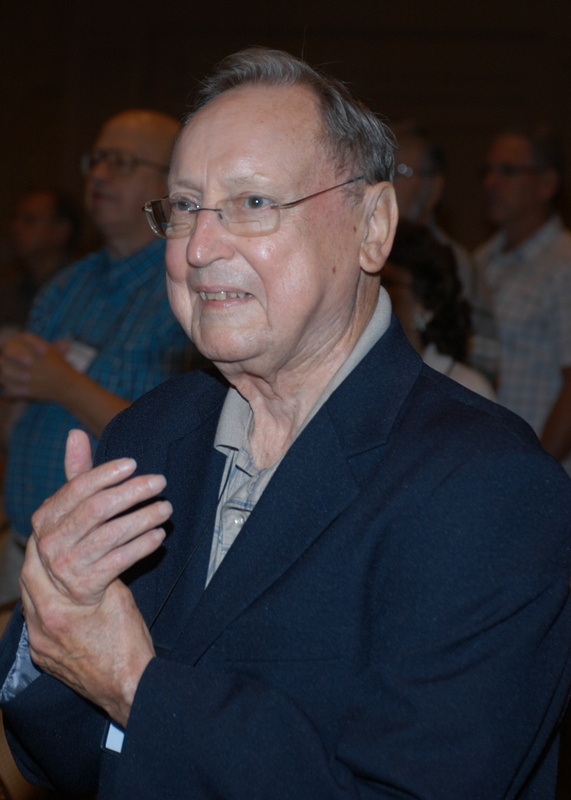 John was a mentor to me for many years, and I’ll greatly miss having him as my spiritual big brother. I witnessed first-hand his great joy for teaching Christ-centered, Trinitarian theology—especially in helping others see how the Old Testament points to Jesus. Just a week before he died, John told me he was resting up, so he would be ready to teach his next GCS course. 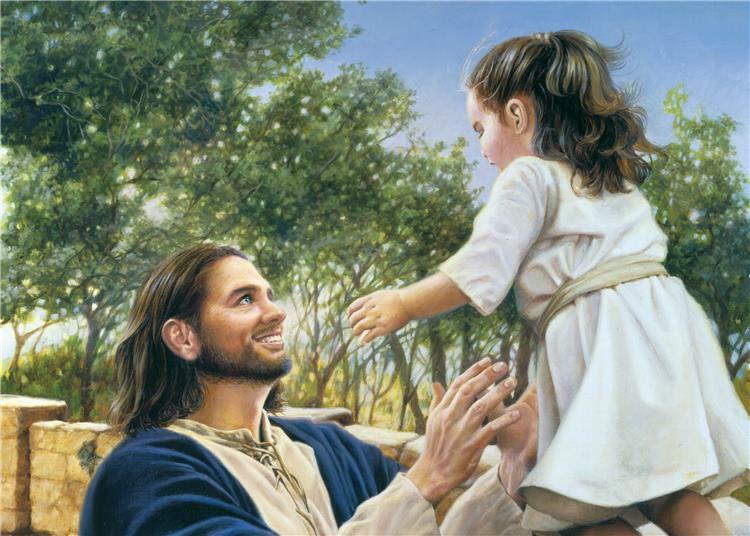 I recall several occasions when a loved one had died, and John would say to me, “They are now in eternity with our Triune God, and there is nothing better than that reality!” Though I will miss him greatly, I rejoice that this is now John’s reality. Thanks to God I have good news to share in regard to my treatment. I recently returned from the hospital where I received the 6th, and last, chemotherapy treatment. Before that the oncologist told me that based on recent blood tests, the prostate cancer I was diagnosed with in January “is asleep and under control with no metastasis found.” I will need to continue follow-up controls, trusting in our Triune God who is the one who sustains our lives. I rest in him, having incredible peace of mind and comfort. Thank you very much for your prayers for me during this trying time. 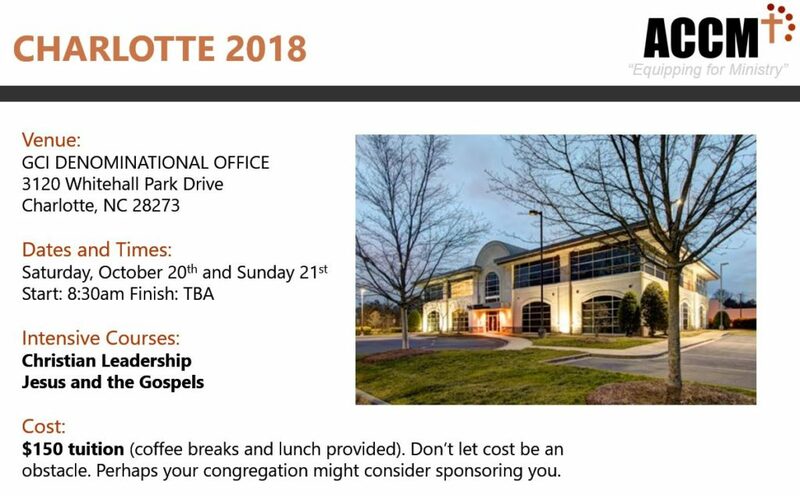 ACCM (Ambassador College of Christian Ministry) will be conducting the two courses noted above at the GCI Home Office in Charlotte, NC, in October. Since the two courses will be offered simultaneously, students must choose one or the other. The courses will utilize an interactive format, making the content accessible and understandable and providing an enjoyable learning experience. Students will find the content interesting, practical and immediately usable in their congregational setting. ACCM offers a GCI-recognized Diploma in Christian Ministry. Completion of one of these courses for credit fulfils requirements for pastoral continuing education in 2018. While the courses are ideal for those without formal ministry or theological training at the Bachelor’s level, they are available for anyone who wishes to learn more and be better equipped for ministry. For additional information and to register, click here. Come celebrate the life and love of God our Father, poured out lavishly on humanity through Jesus Christ, and in the Holy Spirit! Meet believing brothers and sisters from all over the world! You are invited to the 4th annual “Father Loves and Likes You!” Celebration, to be held in Ocean City, Maryland on October 11-14, 2018. To download the information/registration form, click here. View from the Holiday Inn where the celebration will be held. 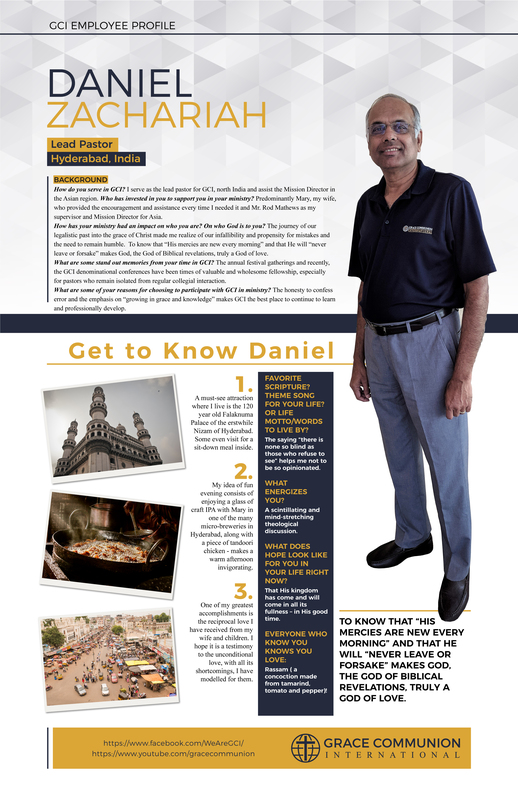 Here is a profile on GCI Pastor Daniel Zachariah, who serves in the northern part of India (click on the image below to enlarge). For a video of an interview with Danny, click here.